Welcome to Heather's page- Team King of Hearts! Thank you for visiting our page. Raising funds for CHD research is critically important and personally very meaningful to us. Please help us to fund CHD research by making a donation to our personal fundraising page. As most of you know, Kingston was born with a VSD, a ventricular septal defect. A ventricular septal defect is a hole between the bottom chambers of the heart. With this, oxygenated blood and deoxygenated blood mix making it harder for the body to supply necessary organs with the oxygen it needs. 1 % of babies are born with a CHD and of that 1 %, 25% of them need life saving surgery within the first year of life. Kingston was one of them. 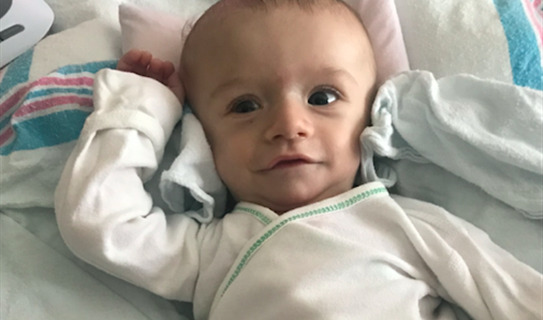 With an amazing team of doctors, on July 9, 2018, he had the surgery that will help him grow to be an adventurous little boy and an amazing man. If you would like to join our team and walk with us on May 19, 2019 at Sunken Meadow Park in Kings Park, NY please register using the drop down on the top left of the page. Whether you can or can't walk with us, feel free to share the link with other friends, coworkers and family. The more donations we have, the more that will go to lifesaving research! Prior to having CHD enter our lives, we never knew that 1 in 100 babies are born with CHD each year. That number is astounding and it is even more astounding that there is such a lack of funding going into research to find our the causes of and cures for CHD. Together we can make a life-saving difference!